If you receive a pop up message within Outlook or in the Office 365 web application (https://365.ocadu.ca) notifying that it is “Time to change your password”, it is legitimate and you should follow the instructions below to change your OCAD U password. IT Services currently requires that users change their passwords every 730 days for security reasons. You are receiving the notification because your password is approaching the maximum age limit. If you receive a targeted email message in your Inbox that does not appear to originate from OCAD U IT Services asking you to change your password, it is very likely to be a phishing attempt and should be reported to itsecurity@ocadu.ca and deleted. 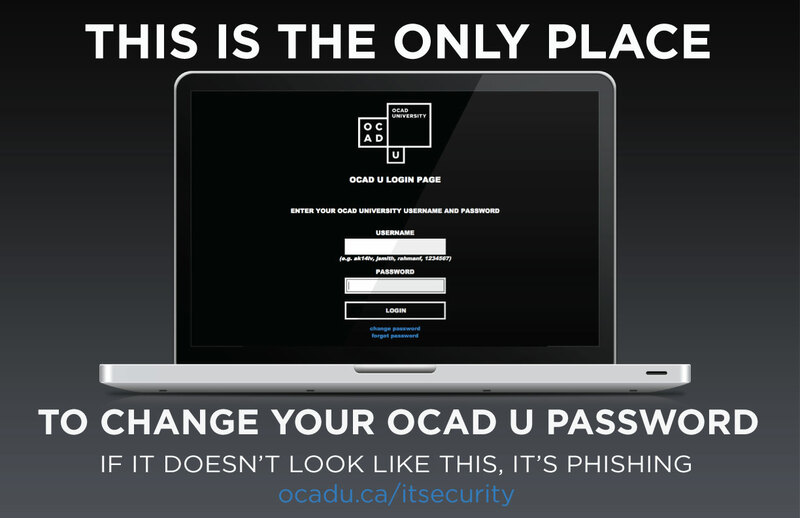 Please note: You cannot change your password within the OCAD U 365 web application. The only place you can change your OCAD U password is at the log in screen that can be accessed by browsing to https://my.ocadu.ca. If you are already logged in to the myOCADU portal, log out and browse to the log in screen (pictured below) to select “Change Password” at the bottom of the screen and follow the prompts.